There was no more than a lot of shouting and posturing, and a very few of the more knuckle-headed of them ‘attacked’ a couple of mosques by daubing slogans on them. It was all pretty tame stuff; certainly compared to what Stockholm’s been going through this week. Yesterday, there was a barrage of buttock-brained tweets aimed at one of our largest energy supply companies, Electricité de France. 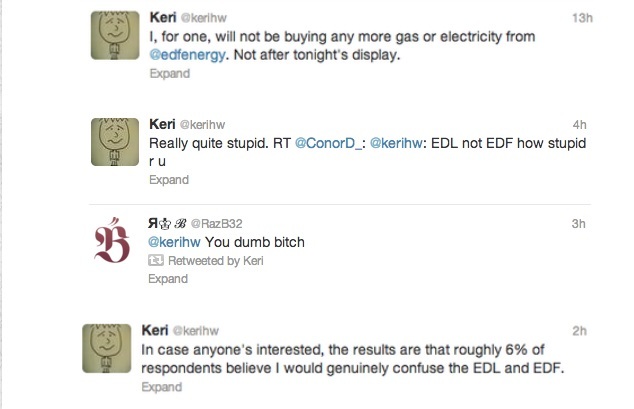 To avoid anyone taking exception to buying from the French, the company is known over here as the more anonymous EDF. 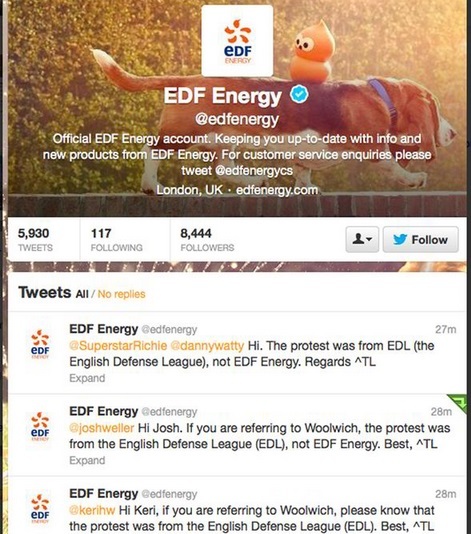 Despite its commercial ambitions, EDF is not an organisation which, like the EDL’s website, calls for “the whole world to unite against a truly Global Jihad”. Whether or not it was a joke, this affair did remind me of a similar, but definitely genuine, confusion of initials from the Stone Age; that is to say, over 20 years ago before the world went online. BCCI (Bank of Credit and Commerce International) was an international bank run by a bunch of crooks and charlatans. It stole money from savers, and ‘recycled’ it back to its founders and shareholders. It also engaged in massive money-laundering for the world’s criminals and terrorists, including Abu Nidal. In early 1991, it was belatedly shut down and in due course a handful of the most egregiously guilty men were convicted and sentenced to prison. BICC (British Insulated Callender’s Cables) was a cable manufacturer and construction company. Its company switchboard and, eventually, even its 1991 Annual General Meeting, was besieged by confused, mainly elderly, shareholders who had held a handful of shares for decades. A colleague of mine was there, and he gleefully reported back on proceedings. Some of the shareholders had dimly recalled having a share certificate (remember them?) from BICC and, having heard a similar-sounding company pilloried in the media, had turned up for the first time in their long lives to an AGM to express their misguided outrage. The directors had to deal with a succession of increasingly angry questions from the floor, from confused old biddies of both sexes. Every time they answered them patiently and politely, yet another deaf and/or dim-witted pensioner would stand up to say much the same thing, but ever more heatedly because they thought that BICC’s directors were being evasive. The meeting went on for hours past its allotted time. 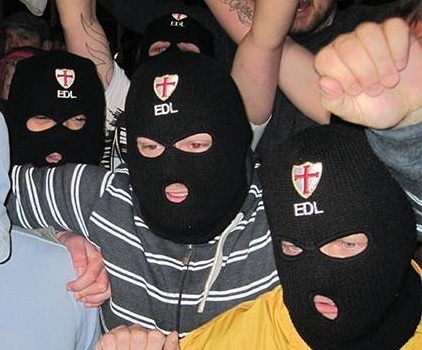 The Daily Mash nails the EDL rather nicely here.